Gold and silver futures were divided Friday but both dropped on the week, marking their second straight weekly losses after scoring three weeks of gains. Gold for December delivery tacked on $2.70, or 0.2%, to settle at $1,297.50 an ounce on the Comex division of the New York Mercantile Exchange. "Gold disappointed today with just a perfunctory bounce as yields and the dollar receded from highs, but largely neglected North Korean threats of a hydrogen bomb test over the Pacific Ocean," Reuters quoted Tai Wong, head of base and precious metals trading at BMO Capital Markets in New York. "With the speculative market quite long and bullion trading just above key technical support levels fresh buyers were scant." Gold futures traded 2.1% lower this week after falling 1.9% last week. They rallied for a combined 4.6% increase in the three weeks before then. On Thursday, gold prices closed at their lowest point since Aug. 24 — a four-week settlement low. The yellow metal is still 12.7% higher so far this year. "Sixteen market professionals took part in the Wall Street survey. Eight participants, or 50%, look for gold to be higher next week. Five, or 31%, called for lower, while three, or 19%, sees sideways prices ahead. Meanwhile, the largest camp in the Main Street survey is back to bullish after a bearish call last week. 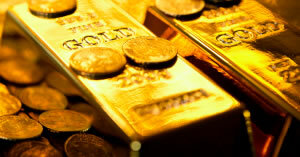 A total of 525 votes were cast, with 237, or 45%, predicting gold will rise in the week ahead. Another 206, or 39%, were bearish. The neutral votes totaled 82, or 16%." Retreating for a second day in a row, silver for December delivery lost 3.4 cents, or 0.2%, to finish at $16.984 an ounce. The settlement is the weakest since Aug. 24 when prices closed at $16.963 an ounce. Silver futures sank 4.1% this week after falling 2.3% last week. They are 6.2% higher on the year to date. October platinum settled down $7.80, or 0.8%, to $932.10 an ounce, for a 4.1% weekly decline. Palladium for December delivery tacked on $8.30, or 0.9%, to $919.85 an ounce, but still slipped 0.2% on the week. The pair of metals is higher on the year so far with advances of 2.9% for platinum and 34.6% for palladium. Gold added $2.70, or 0.2%, to 1,294.80 an ounce. Silver rose 2 cents, or 0.1%, to $16.97 an ounce. Platinum rose $2, or 0.2%, to $935 an ounce. Palladium was unchanged at $916 an ounce. For the week, their losses totaled 2.1% for gold, 4.1% for silver, 4.2% for platinum and 0.9% for palladium. Gold coins advanced by 4,500 ounces compared to 3,500 ounces previously. Splits this week included 3,000 ounces in American Gold Eagles and 1,500 ounces in American Gold Buffalos. Last week, gains came entirely from American Gold Eagles. Silver coins climbed by 50,000 ounces, matching last week’s total of 50,000 ounces. Also for a third straight week, American Silver Eagles accounted for all silver sales. I got a new email address. Thanks! Palladium is only $17 less than platinum per ounce at close on Friday! Amazing.